On November 17, 2018, about 1120 eastern standard time, a TL-2000 StingSport, N494N, was substantially damaged during an in-flight separation of the horizontal stabilizer near Clermont, Florida. The sport pilot successfully deployed the Ballistic Recovery System (BRS) parachute and received minor injuries during the landing. Visual meteorological conditions prevailed, and no flight plan was filed for the flight which departed Arcadia Municipal Airport (X06), Arcadia, Florida about 1030. The personal flight was conducted under the provisions of Title 14 Code of Federal Regulations Part 91. In a written statement, the pilot stated he was in cruise flight when he received an ADS-B traffic alert via a commercial application he had running on his smartphone. The traffic approached from his one o'clock position and closed at "a high rate of speed." According to the pilot, he entered a shallow, descending turn to the left to increase separation with the traffic. As he levelled the airplane following the descent, he noted that his airspeed had increased to 138 knots. When he noted the airspeed, he "rapidly" reduced engine power below "50%" at which point the airplane yawed and entered a spin to the left. The pilot said he arrested the spin, and that the airplane initially responded to elevator inputs to raise the nose and level off. When the nose of the airplane pitched forward uncontrolled, the airplane entered a high-speed, nose-down descent, and the pilot deployed the BRS parachute. According to Federal Aviation Administration (FAA) records, the pilot held a sport pilot certificate with a rating for airplane single-engine land. The pilot reported 182.8 total hours of flight experience; 67.4 hours of which were in the accident airplane make and model. According to FAA records, the airplane was manufactured in 2005 and had accrued 337.5 total aircraft hours. It was equipped with a Rotax 912ULS, 100-horsepower engine that drove a fixed-pitch propeller. The published maneuvering speed (Va) was 118 knots. The airplane's most recent annual inspection was completed December 1, 2017 at 319.1 total aircraft hours. At 1156, weather recorded at Kissimmee Gateway Airport (ISM), 17 miles southeast of the accident site, included clear skies, visibility 10 miles, and winds from 090° at 5 knots. The temperature was 22° C, the dew point was 13° C; and the altimeter setting was 30.18 inches of mercury. Examination of photographs revealed the airplane came to rest upright, with the nose landing gear collapsed. The horizontal stabilizer was separated from its mount and was located intact about 1,000 feet east of the main wreckage. The stabilizer mount plate and mounting studs themselves were intact and undamaged, but the composite structure and adhesive joints surrounding them were torn and peeled away from the main tail structure. The elevator push-pull tube was fractured at the point where the tube exited the empennage and the fracture surfaces displayed signatures consistent with overstress failure. 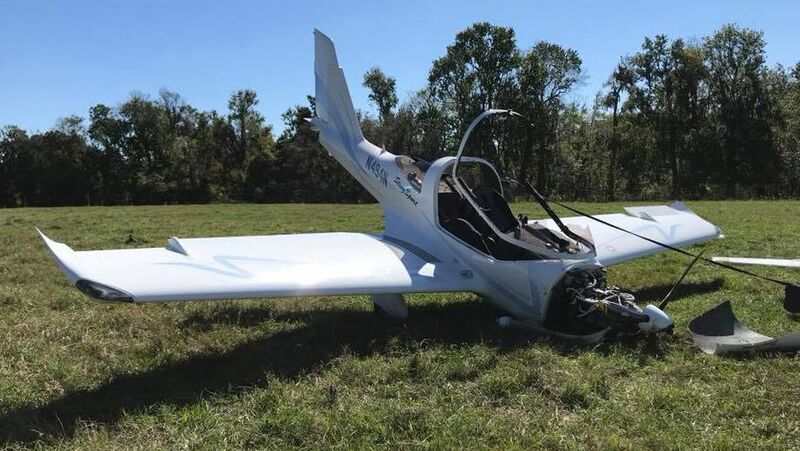 CLERMONT, Florida — The pilot of a TL-Ultralight Sting Sport aircraft escaped major injury after a crash Saturday morning, officials said. 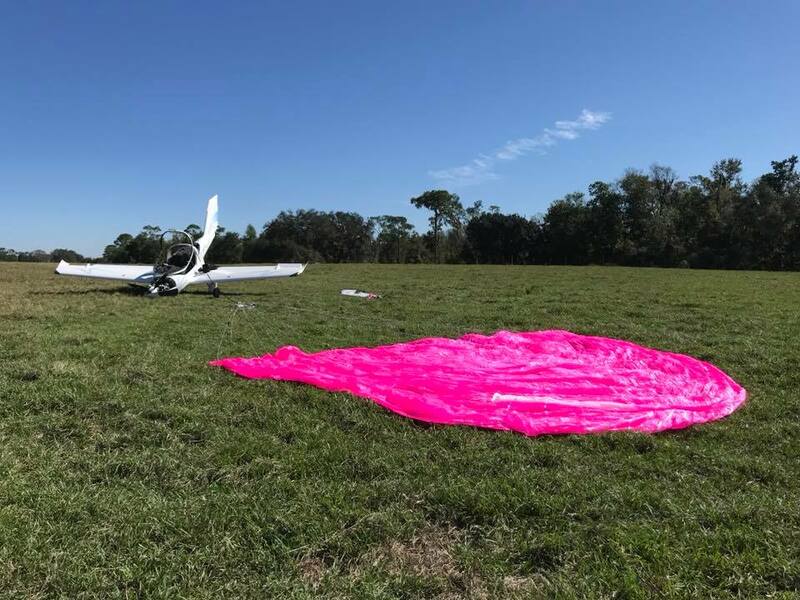 The Federal Aviation Administration is investigating the crash of a small plane that went into a cow pasture in Clermont around 11:55 a.m.
Lake County Fire Rescue said they responded to the area near Frank Jarrell Road and treated the pilot at the scene for minor injuries. There was only one occupant in the plane during the crash. That's an awfully nice looking field, I probably would have elected to go for a landing. But I guess if you got the chute might as well use it! Missing a Hz Stab and Elevator, that could be the reason for the chute.